Jack Black Pure Clean Daily Facial Cleanser with Aloe & Sage Leaf is a "dual-purpose 2-in-1 liquid cleanser and toner" that effectively "removes deep-down dirt and oil, for clear, smooth, shave-ready skin. Works gently, without over-drying, to leave your complexion clean, hydrated and fresh." Pure Clean cleanses the face and neck with a rich lather that gently and effectively removes dirt and debris without irritation or dryness, leaving skin clean, clear and smooth. This PureScience™ formula locks in nature's best to please even the most sensitive skin using a blend of naturally-derived surfactants and certified organic ingredients. Witch hazel acts as astringent, toner, anti-irritant, and potent antioxidant as certified organic sage leaf extract provides antibacterial and anti-inflammatory benefits to skin. Certified organic chamomile extract and aloe leaf extract calm, soothe, and reduce redness. It's dermatologist tested, fragrance-, alcohol-, and colorant-free. Suggested Use: Apply a nickel-size amount to wet hands, work into a lather and apply to face with fingertips using a circular motion. Rinse. Use in the morning before shaving, and at night to cleanse skin. My husband has been using, and loving, Pure Clean each day in the shower and just raves about it. He asserts that it not only thoroughly cleanses his skin, but also leaves his face unbelievably soft, smooth and moisturized. When used before shaving it preps the skin and softens the hairs making for an effortless close shave. He also noted that his very resilient waterproof sunscreen, that is quite difficult to remove after surfing, is effortlessly swept away by Pure Clean. Therefore, it is his assessment that this is a unique cleanser that not only deeply cleans the skin, but also moisturizes and tones it like nothing that he has tried before. I myself gave it a try, and was surprised by how well it cleaned and moisturized my skin without leaving it the least bit stripped. Oat and Coconut derived surfactants: Work into a thick rich lather to gently cleanse skin and break down pore clogging residue. Certified Organic Sage Leaf Extract: Provides antibacterial and anti-inflammatory benefits. Certified Organic Chamomile Extract: Soothes calms and helps reduce redness and acts as an antiseptic. Rosemary Extract: Helps control oiliness and fights bacteria on the skin's surface. Aloe Leaf Extract: Helps soothe calm and soften skin. Lavender Extract: A natural botanical that encourages healing and soothes skin. Ingredients: Water (Aqua), Sodium C14-16 Olefin Sulfonate, Disodium Cocoamphodiacetate, Aloe Barbadensis Leaf Juice*, Cocamidopropyl Betaine, Sodium Lauroyl Oat Amino Acids, Glycol Distearate, PEG-150 Distearate, Hamamelis Virginiana (Witch Hazel) Extract, Glycerin, Lavandula Angustifolia (Lavender) Extract*, Salvia Officinalis (Sage) Leaf Extract*, Chamomile Recutita (Matricaria) Flower Oil, Rosmarinus Officinalis (Rosemary) Leaf Oil, Salvia Officinalis (Sage) Leaf Oil, Backhousia Citriodora Oil, PEG 8-Dimethicone, Sodium Chloride, Sodium PCA, Cetyl Alcohol, Citric Acid, Benzyl Alcohol, Dehydroacetic Acid. * Certified Organic. $18.00 for 6 oz. from Jack Black (Unaffiliated Links). Jack Black Pure Clean Daily Facial Cleanser with Aloe & Sage Leaf was the Men's Health Award 2007 - Runner-Up Best Facial Cleanser. No Shave November is upon us. 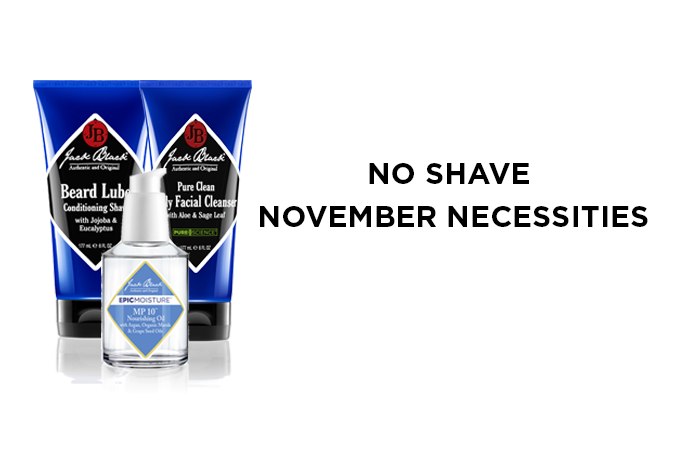 No Shave November is a grassroots effort designed to raise awareness and money for the American Cancer Society. Cancer patients typically lose their hair during the course of treatments and not shaving for a month shines a spotlight on their cause. It’s okay to have fun with it. Create a team and have contests for who can grow the craziest beard and who can raise the most money. But even though a “crazy” beard may be a bit more bohemian than your normal look, it doesn’t give you an excuse to be unkempt. Your newborn scruff might end up staying a while and with proper care and maintenance, may turn No Shave November into No-Shave December. In order to keep your beard looking healthy and effortless, you need to take care of it. Load up on some of our favorite products to keep your whiskers game on point this month. Clean as a Whistle. With Pure Clean Daily Facial Cleanser, you can remove stubborn dirt and oil for a deep down clean for beard and face. Load a nickel-size amount into wet hands, work into lather and apply to face with fingertips using a circular motion. Rinse. Strength and Conditioning. Our Beard Lube Conditioning Shave is a pre-shave oil that replaces creams and gels when shaving. But it can also be used as a conditioner during No-Shave November. The moisture-binding formula helps to soften and smooth facial hair so it won’t look scraggily. Control vs. Chaos. Keep those non-conformist whiskers in check with our MP 10 Nourishing Oil. This versatile treatment can be used for conditioning, styling or finishing. Argan oil, in combination with nine other natural oils, provides smoother, shinier hair. No Shave November is a great effort for a great cause. Join your follicles and raise awareness and money. You’ll be using one of these again soon enough. Overall Assessment: An excellent cleanser and a very worthy cause! Well, this all sounds lovely, but I wonder how many men actually use cleansers. It took me years before I could convince my fiancé to start using moisturizer! Good point, Melissa! I just put stuff in front of my husband and tell him to use it! I also tell hime that "we" are going to be testing some products on him. He's become so accustomed to it that he now comes to me asking for products to use! I have my husband using the Kiehl's facial fuel. Jack Black actually has a very nice serum called "Protein Booster Serum" that I used for a while on the advice of a Nordstrom beauty advisor who told me that the men's stuff is just as good but cheaper (because men just won't pay the price women will). It seemed fine for me at the time. One of my closest friends uses Kiehl's Facial Fuel and he loves it! I dragged him to Nordstrom with the express purpose of getting him a simple skincare routine so that he would stop using regular bar soap. He has been so happy with the line. I have often heard the same thing about the price differential between the products marketed for men and women, and often think that it is true that many are interchangeable. We of course are willing to pay just about anything for quality products, whereas that is less often the case with men. That said, things are a little different here in Los Angeles, and many men are willing to pay top dollar for skincare products, and I see it all of the time at Barneys! I forgot to mention that my husband tends to use whatever products I ask him to test, or that I tell him that he should be using! He used to feign disinterest, but no longer does that, and in fact often comes to me asking for a product for this or that! Mine has certainly gotten better. It really started with pushing him to use better sunscreens while surfing and then I pushed better skincare after he got home from the beach! It's taken some coaxing on my part, but he has definitely come around. I once bought him a whole Kiehl's set of products (all very basic and not too many steps, and he didn't touch it! )– so I definitely understand your frustration in spending money on stuff that your husband didn't bother with!